Throwback Thursday! Development has been a long time coming to Clarendon/Montrose. 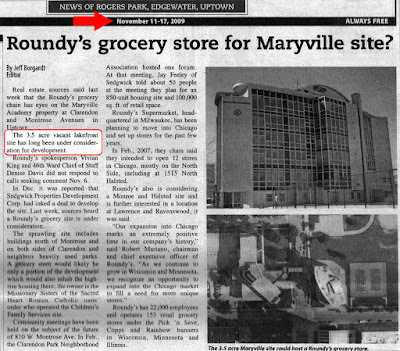 In this November 2009 News-Star front-page article, a deal was in the works for Sedgwick Properties to build 850 new housing units and a Roundy's supermarket on the site along with 100,000sf of retail space. Several community meetings had already been held (spoiler alert -- many, many more were to come). Finally, in 2016, another developer and a much smaller plan has made its way through the community and city council approval process. Nothing happens easy in Uptown.... but we're glad this finally seems to be happening.